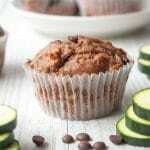 I know zucchini is soo last year and now cauliflower is the vegetable of the moment, but I think you will forgive me when you try these delicious Double Chocolate Chip Muffins with Zucchini. They are so good! If you have been reading my blog posts you will know I am a huge advocate for vegetables. And in my blog post all about getting veggies into the lunchbox we chatted about how important they are in healthy diets. Vegetables are so important – they should be around 1/3 of what we are eating on a daily basis. So this means if we want to achieve this we really need to get veggies on our plates at every opportunity. And I think means we need to get inventive with how we offer vegetables. Now I am a little on the fence about ‘hiding’ veggies. 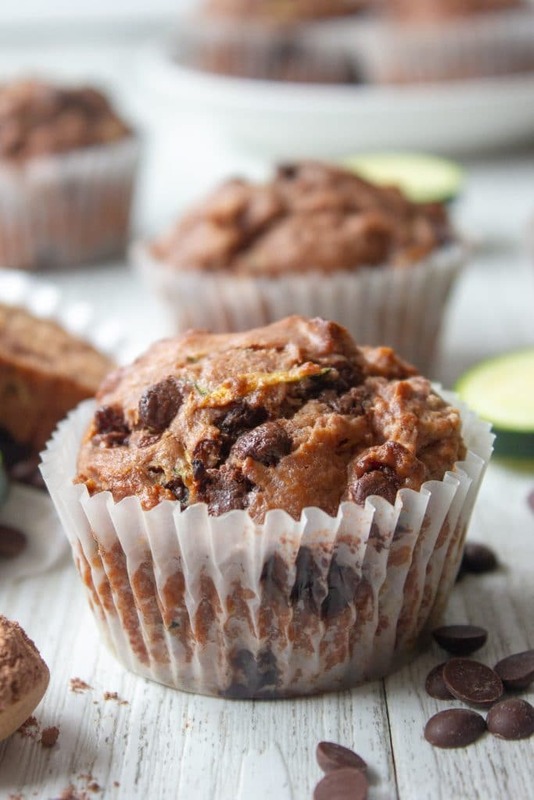 Yes, I do put zucchini in these Double Chocolate Chip Muffins with Zucchini. But I do tell my kids what’s in them. That way they know what they’re eating and it normalises vegetables. 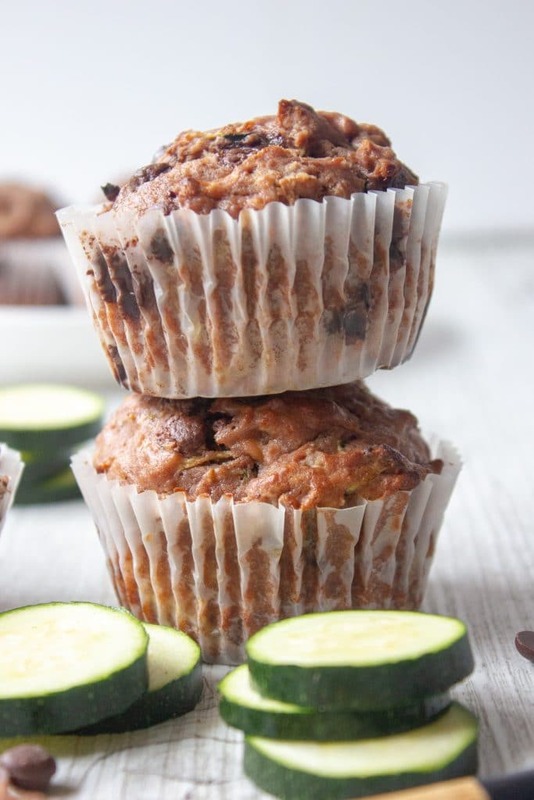 So anyway back to these Double Chocolate Chip Muffins with Zucchini. They are really delicious. 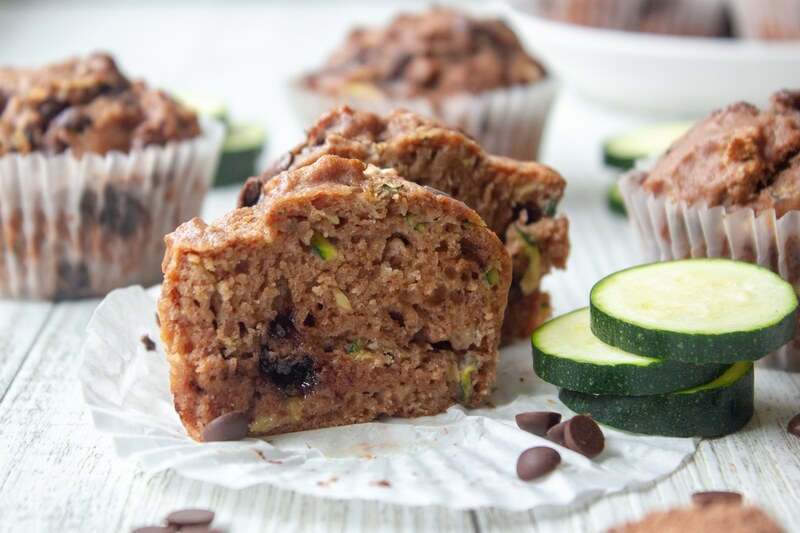 My kiddies gobble these down, as do I. I love the addition of zucchini in baking they just seem to make the muffins very light. And with the combination of Greek yogurt they really add a nutritious punch to the chocolate chip muffin. 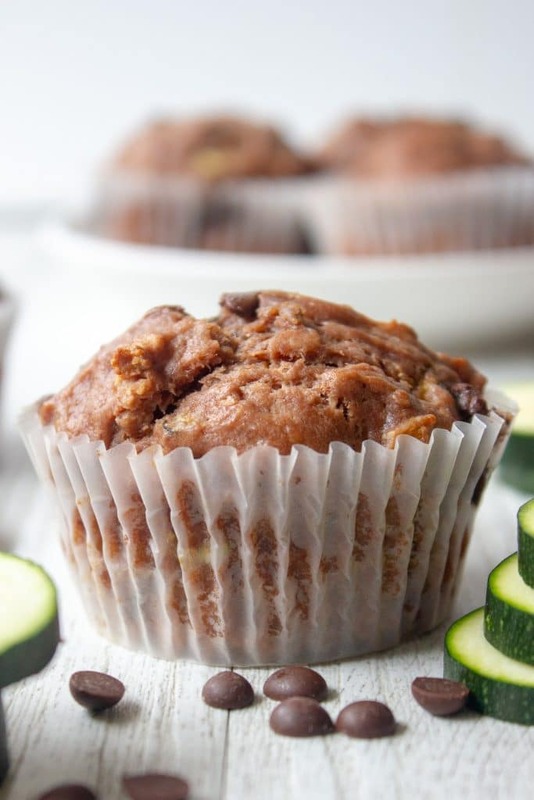 If you love zucchini in muffins try these Cheese & Vegetable Lunchbox Muffins or these Apple Zucchini Muffins. This is a really big batch, making 18 muffins so a great recipe to prepare for school lunches ahead of time. 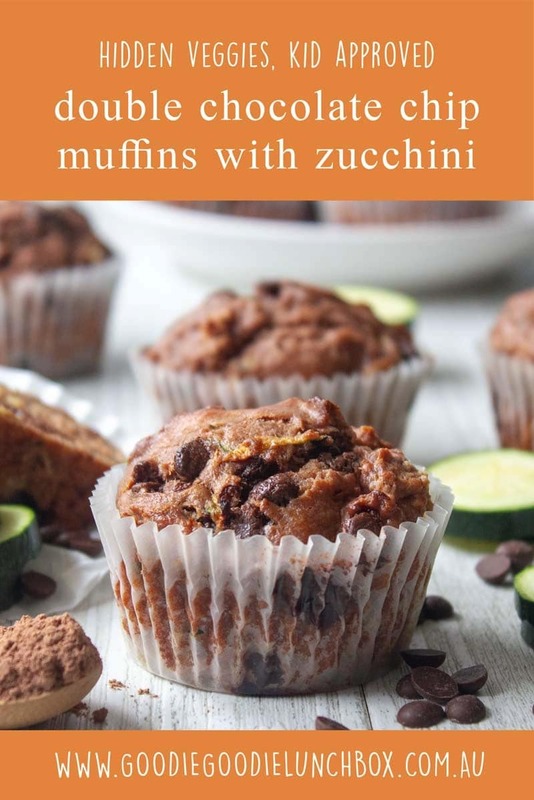 To freeze your Double Chocolate Chip Muffins with Zucchini, let them cool completely before placing in a large zip lock bag or in a container. Then you will have muffins all term long…or at least for a few weeks! 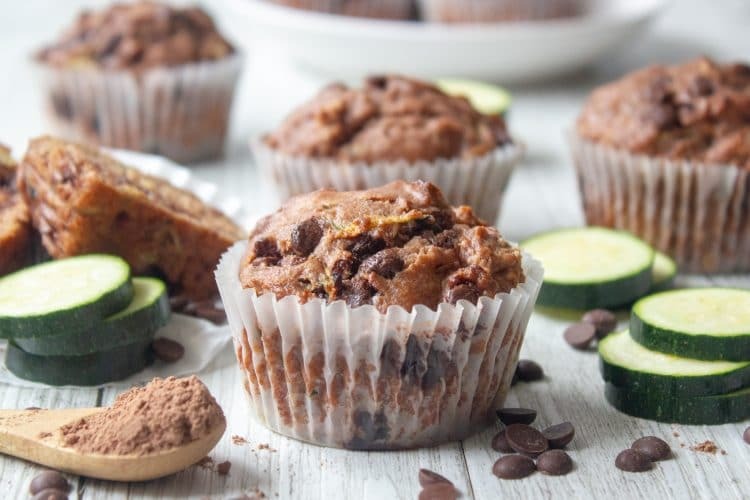 These delicious Double Chocolate Chip Muffins with Zucchini are a fantastic way to add a nutrient boost to lunchbox baking. Totally kid approved! Preheat an oven to 180c and thoroughly grease a medium sized muffin tin. Bake for around 12-15 minutes or until the muffin springs back when touched and a skewer inserted into the centre of the muffin comes out clean. There is no need to squeeze out the liquid from the zucchini for this recipe. I hope you will enjoy these. They are really yummy and fantastic for the lunchbox. If you make these, I would love for you to rate the recipe! As always, if you bake these pop on over to Instagram and share you pics with me and while you are there check my feed for lots of lunchbox inspiration! Keen to try these! If you wanted to leave the cacao out, would you need to up the flour? Also, does olive oil flavour them – can you use something like vegetable or rice bran oil? I used home grown olive oil which isn’t mild at all, and I couldn’t taste it. Then again I may be used to it. Hope that helped you. Oh that does sound like a great swap! The twins and I finished our last batch yesterday so I am going to bake some more this weekend! Made a double batch of these in the hope they would be liked and they are a huge success. Can’t keep hubby and the kids away from them. Still got plenty for the freezer as they make a huge bath of mini muffins! Amazing! Made them with low fat greek yogurt and milk chocolate chips. Thank you! Hi, can SRF be substituted with Oatmeal or wheat meal? Same proportion?